This weekend Everton travel to face Oldham Athletic in the 5th Round of the FA Cup, with the Blues looking to take a step closer to a possible return to Wembley. Back in 1990, also in the 5th Round of the Cup, Everton were again drawn away to play Oldham, at the time managed by Everton legend Joe Royle. 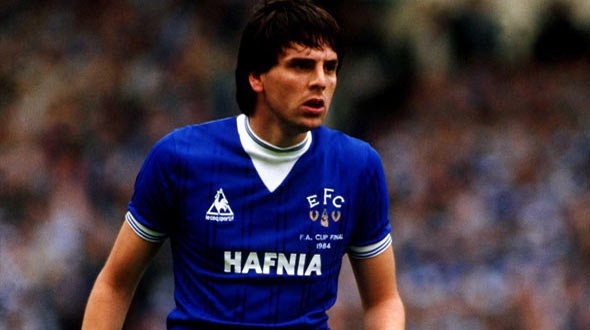 Everton were huge favourites to progress, but as Graeme Sharp explains, the refereeing performance over the first two games cost Everton and manager Colin Harvey dear. “I remember it clearly. We were winning 2-0 and cruising on the plastic, then he (the referee) gave a ridiculous penalty decision against us. “Roger Palmer was the striker involved, and when I went to Oldham a few years later he was still laughing about it with me. “We were never in any danger, but that gave them a toehold back into the game. They came back to draw 2-2 and I was fuming afterwards. “I had a few choice words with the referee and that got me into trouble, but the decisions were significant. In the event it was Oldham who marched on to the semi-finals that season, after eventually triumphing in a fifth round second replay against the Blues – and yet more controversy. The FA, in their infinite wisdom, used to allow the same referees to take charge of replays even if the original cup tie had proved controversial. It was a decision which backfired in 1990. Just four days after their 2-2 draw at Boundary Park, Tony Ward took charge of the replay at Goodison Park, and the night proved even more eventful than the first clash. Everton’s Norman Whiteside was sent off for the first time in his career, six players were booked and Everton had to rely on a Kevin Sheedy penalty three minutes from the end of extra-time to salvage a second replay. Sharp’s comments at the time were pointed. “Thirty-six thousand people can’t be wrong,” he said. “They saw his performance tonight and it was poor, very poor for a game of this stature. Twenty three years on and Sharp remembers other events surrounding that night. “Some of the local press lads rang me the next day and when you’re involved in a match as heated as that you maybe don’t appreciate some of the things that are going on around you. “But one of the press men told me he had been watching games at Goodison Park for more than 30 years and had never seen an Everton team play as badly as that. He said it was disgraceful. Everton lost the toss for choice of venue and were forced to return to Oldham’s dreaded plastic pitch, but at least the FA appointed the highly regarded Roger Milford as referee on this occasion. It didn’t help the Blues, who took the lead through Tony Cottee, but then gave up a dreadful equaliser through a sloppy Neil McDonald back pass and then went out to yet another penalty kick, this time however it was uncontested.